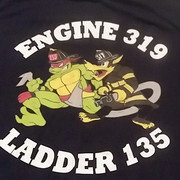 When I was in Proby school our class was the first class to be issued blue jeans and a blue tee shirt with FDNY maltese cross and FDNY on back. Only problem was that the maltese cross was stenciled almost under your left arm...you lifted your arm to reveal the maltese cross. Fast forward 3 months later. At my newly assigned company E 88 we get word that "Modells" on Fordham Road is selling FDNY tee shirts. We jump on the rig and off we go, as we pull up we see (obvious non-firefighters) walking down the sidewalk from Modells sporting tee shirts with FDNY across the back. Inside, on a closeout table was a pile of the ill stenciled tee's going for $1.50. We bought out the whole lot. C'mon Johnny, I think you mighta called those blue jeans -"dungarees" when you were a kid. But, I do like the reading Johnny - keep it going, thanks!